NEW YORK, July 27, 2009 – After weeks of dunk contests, ten semifinalists have been selected from among amateur dunkers across the U.S., and it is now up to the fans to select which four dunkers will go on to compete in the first-ever Sprite Slam Dunk Showdown at NBA All-Star 2010 in Dallas, Texas. 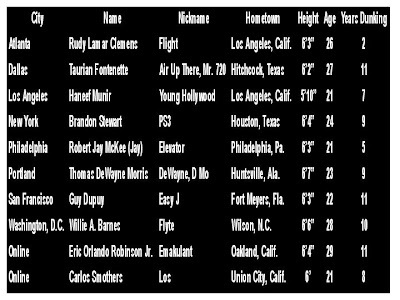 Fans can visit NBA.com/dunk to watch dunks from each of the ten semifinalists and vote on who they think should be flown to NBA All-Star in February to compete for the chance to be crowned the Sprite Slam Dunk Showdown Champion. The winner will receive a grand prize of $10,000 and will attend the Sprite Slam Dunk contest during NBA All-Star Saturday Night on Feb. 13, 2010. Sprite Slam Dunk Showdown competitions were held in eight cities during May, June, and July at NBA Nation presented by T-Mobile and Kia Motors, the league’s touring vehicle that transforms into a 20,000-square-foot basketball playground. The competitions were open to all local dunkers, ages 18 and up, who were able to show off their dunking skills before a panel of judges at NBA Nation. One winner from each of the eight cities was selected by the fans via SMS text voting. Fans that could not attend the NBA Nation stops were able log on to www.NBA.com/dunk to upload videos showcasing the best dunks. LeBron James led a panel of judges that picked two winners from among the online entries. The eight local winners from the tour combined with the two online winners to make up the group of 10 semifinalists, and now fans are being asked to narrow the group to four best-of-the-best finalists. The voting period begins today and runs through August 24, 2009. Sprite is the world’s leading lemon-lime soft drink and has been the official soft drink of the NBA since 1994. Voting is super easy! Just head over to the voting page (link: http://www.nba.com/dunk) to see some amazing footage of their skills and then vote for your favorite. No registration is required and voting literally takes just a few seconds. The top four dunkers will be sent to the 2010 NBA All-Star Weekend in Dallas. There they will compete for the $10,000 Grand Prize and the opportunity to be involved on the Saturday night NBA Slam Dunk Contest.